Staircases come in all sorts of sizes and arrangements depending upon the property. The main common features are illustrated below and the terminology is explained in the full glossary below that. Over the years the basic features of staircases have not changed, however the style of the newel posts and balusters have changed (on older staircases, the newel posts and balusters were often more ornate) and on some staircases the balusters were replaced by a solid in-fill. 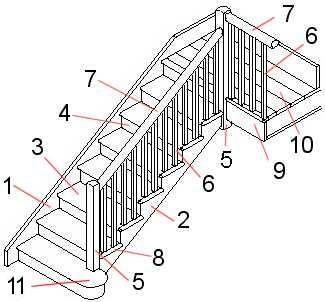 Traditionally, the various staircase parts were made in a workshop and the staircase was built on site. Modern staircases are often mass produced so that the assembly on site is minimised. The basic traditional method for securing the treads and risers to the stringers was the use of wedges (as right) while the treads and risers were secured to each other using glued blocks. Modern, mass produced staircases tend to use glued blocks between the treads/stringers and treads/risers. Balusters - The vertical posts under a banister to the treads of the staircase or to the floor on a landing. Banister - The handrails down the side of a stairway. Curtail step - The bottom step of a staircase where it projects sideways and curves around like a 'cur's tail'. Fascia - The vertical board under the edge of an exposed landing. Finial - A turned or carved ornament usually in the shape of an urn, ball, bun, spike or figure, often used to decorate the ends of staircase newel posts. Half Landing - The flat area of flooring where a stairway makes a turn between floors. Inner (closed) string - The side of a stairway locating the treads and risers which is set against a wall. Landing - The flat area of flooring at the top and bottom of a stairway leading to rooms. Newel post - The vertical post at the turn or end of a banister. Outer (open) string - The side of a stairway locating the treads and risers which is open to view. Return nosing - The moulding applied to the ends of the treads where there are exposed in a hallway. Riser wedge - The, normally wooden, wedges used vertically underneath a staircase to secure the risers to the stingers. 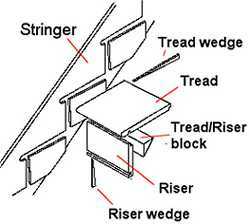 Tread wedge - The, normally wooden, wedges used horizontal underneath a staircase to secure the treads to the stingers. Tread/riser blocks - The, normally wooden, blocks used to secure the top of the risers to the front of the treads along the front edge of steps.